These pictures can't do justice to how big the step the step is in the case. You really have to hold it in your hand. Be careful picking up range brass before reloading. It may be just me, but looking at the primer end pic, but it looks "cratered" and a bit flattened to me. Not only is it stepped, but maybe even reloaded & not a factory load? Not uncommon for factory 9mm and .40 to show cratered primers. These stepped cartridge cases do seem to pose a real challenge to the reloader. this has been posted on CB several times. Thanks Dan for the info about the factory rounds! To be honest, I do not shoot many factory 9mm( I don't load .40), but just reload them, & I shoot out in places that are not ranges,( like friends "back 40" field & public hunting lands), so I do not have a lot of experience in looking at the factory primers from shooting them or picking them up. I just reckoned that factory 9mm wouldn't have what I consider to be excessive/over pressure signs. Thanks again, for filling me in though! One of the reasons I like using my Lee Classic Cast Turret is inspecting cases as I put them on the press. I take a quick glance at the inside of the case to see if there is a problem like the brass described or something inside the case. I can also catch berdan primed cases this way. I shoot 380, 9x18 and 9x19 so I've developed a habit to stand all my cases after pin tumbling to sort them out by height and I always do a quick look inside to cull those stepped cases. There are a few more of these topics, but if folks want more info they can look for them. That’s one headstamp. There’s a reloader, company, that has used stepped brass w/ multiple headstamps. They seem to file for bankruptcy every so often and magically reopen w/ a new name and new headstamp. Whoever invented those cartridges should be strung up. Last couple of times I purchased bulk (5K) 9mm range brass, there were a few of those Mag Tech stepped cases. However, not all Mag tech cases are that way. Majority, were normal. IIRC, they are made by CBC. The B stands for Brazil. I have no complaints with Mag Tech or CBC brass...........I load and shoot, after discarding the stepped ones. In fact, I use most of the various foreign 9mm headstamps, with good results..........PMC, S&B, Aguila, etc. Otherwise, be scrapping half of the bulk buy. Last edited by winelover; 01-29-2019 at 03:10 PM. I have found 3 or 4 different head stamps with stepped cases I pitch them in to the scrap brass bucket. It would be interesting to de-mil one of those 9's to see if there's substantially less powder. Makes sense, less case space less powder for the same pressure? Industry has some gimmik going here and our best interest ain't first and foremost. Too bad we can't make them put a warning on the side of each case saying 'do not reload'...they'd prolly stop this crup. This is new to me. Glad to see it. Fortunately, I haven't reloaded 9mm in a very long time so, assuming this is a relatively "new" thing, I won't worry about any that I already have and I'll check carefully going forward. Perhaps the step is to prevent bullets from being pushed back into the case when slammed into feed ramps on full auto guns? The step is to prevent bullet setback in general. These cases have caused kabooms and there are pictures. I don't think setback is the primary purpose of that design. I'd have to look for references i came across, but the stepped cases are a cheaper way to make brass. 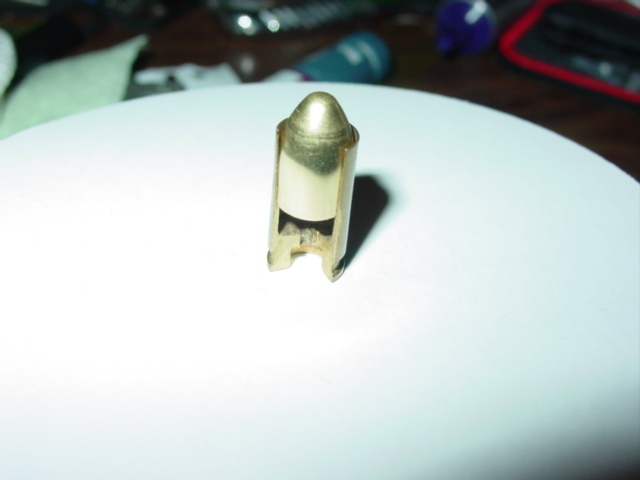 Here is a pic of a stepped case (not mine), and the step is not located at the bullet heel. I would think the stepped case should mean less powder capacity. Therefore less powder needed to maintain the needed pressure to cycle the action sufficiently. Even though more brass is used to manufacture the case, maybe that's cheaper then using more powder for the same pressure level. Something I picked up here but bears repeating- a quick way to sort 9mm, .380, 40 S&W brass is check a range garbage can for the plastic packaging trays for 40 S&W. Dump all the cases in the tray, shake until holes filled and cases stand up. The difference is obvious.